Long before the Apollo missions reached the Moon, Earth’s only satellites has been the focal point of intense interest and research. But thanks to the samples of lunar rock that were returned to Earth by the Apollo astronauts, scientists have been able to conduct numerous studies to learn more about the Moon’s formation and history. A key research goal has been determining how much volatile elements the Moon possesses. Intrinsic to this is determining how much water the Moon possesses, and whether it has a “wet” interior. If the Moon does have abundant sources of water, it will make establishing outposts there someday much more feasible. However, according to a new study by an international team of researchers, the interior of the Moon is likely very dry, which they concluded after studying a series of “rusty” lunar rock samples collected by the Apollo 16 mission. The study, titled “Late-Stage Magmatic Outgassing from a Volatile-Depleted Moon“, appeared recently in the Proceedings of the National Academy of Sciences. Led by James M. D. Day of the Scripps Institution of Oceanography at the University of California, San Diego, the team’s research was funded by the NASA Emerging Worlds program – which finances research into the Solar System’s formation and early evolution. Determining how rich the Moon is in terms of volatile elements and compounds – such as zinc, potassium, chlorine, and water – is important because it provides insight into how the Moon and Earth formed and evolved. The most-widely accepted theory is that Moon is the result of “catastrophic formation”, where a Mars-sized object (named Theia) collided with Earth about 4.5 billion years ago. The debris kicked up by this impact eventually coalesced to form the Moon, which then moved away from Earth to assume its current orbit. In accordance with this theory, the Moon’s surface would have been an ocean of magma during its early history. As a result, volatile elements and compounds within the Moon’s mantle would have been depleted, much in the same way that the Earth’s upper mantle is depleted of these elements. For the sake of their study, the team examined a lunar rock named “Rusty Rock 66095” to determine the volatile content of the Moon’s interior. These rocks have mystified scientists since they were first brought back by the Apollo 16 mission in 1972. Water is an essential ingredient to rust, which led scientists to conclude that the Moon must have an indigenous source of water – something which seemed unlikely, given the Moon’s extremely tenuous atmosphere. Using a new chemical analysis, Day and his colleagues determined the levels of istopically light zinc (Zn66) and heavy chlorine (Cl37), as well as the levels of heavy metals (uranium and lead) in the rock. Zinc was the key element here, since it is a volatile element that would have behaved somewhat like water under the extremely hot conditions that were present during the Moon’s formation. Ultimately, the supply of volatiles and heavy metals in the sample support the theory that volatile enrichment of the lunar surface occurred as a result of vapor condensation. In other words, when the Moon’s surface was still an ocean of hot magma, its volatiles evaporated and escaped from the interior. Some of these then condensed and were deposited back on the surface as it cooled and solidified. This would explain the volatile-rich nature of some rocks on the lunar surface, as well as the levels of light zinc in both the Rusty Rock samples and the previously-studied volcanic glass beads. Basically, both were enriched by water and other volatiles thanks to extreme outgassing from the Moon’s interior. However, these same conditions meant that most of the water in the Moon’s mantle would have evaporated and been lost to space. These results contradict other studies that suggest the Moon’s interior is wet, one of which was recently conducted by researchers at Brown University. By combining data provided by Chandrayaan-1 and the Lunar Reconnaissance Orbiter (LRO) with new thermal profiles, the Brown research team concluded that lots of water exists within volcanic deposits on the Moon’s surface, which could also mean there are vast quantities of water in the Moon’s interior. To these, Day emphasized that while these studies present evidence that water exists on the lunar surface, they have yet to offer a solid explanation for what mechanisms deposited it on the surface. Day and his colleague’s study also flies in the face of other recent studies, which claim that the Moon’s water came from an external source – either by comets which deposited it, or from Earth during the formation of the Earth-Moon system. Those who believe that lunar water was deposited by comets cite the similarities between the ratios of hydrogen to deuterium (aka. “heavy hydrogen”) in both the Apollo lunar rock samples and known comets. Those who believe the Moon’s water came from Earth, on the other hand, point to the similarity between water isotopes on both the Moon and Earth. In the end, future research is needed to confirm where all of the Moon’s water came from, and whether or not it exists within the Moon’s interior. Towards this end, one of Day’s PhD students – Carrie McIntosh – is conducting her own research into the lunar glass beads and the composition of the deposits. These and other research studies ought to settle the debate soon enough! And not a moment too soon, considering that multiple space agencies hope to build a lunar outpost in the upcoming decades. If they hope to have a steady supply of water for creating hydrazene (rocket fuel) and growing plants, they’ll need to know if and where it can be found! 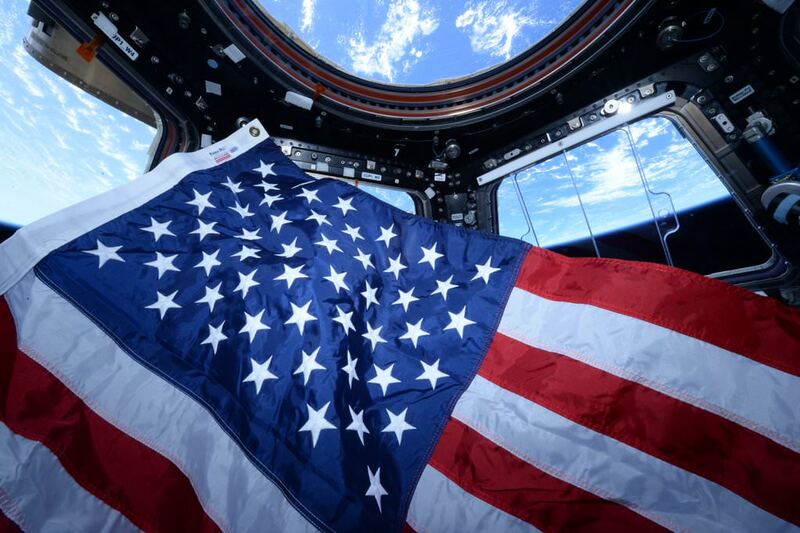 The entire NASA family on Earth and NASA’s two astronauts serving aboard the Earth orbiting International Space Station (ISS) salute all our country’s brave veterans on this Veteran’s Day, Nov. 11, 2015. NASA astronauts Scott Kelly and Kjell Lindgren saluted America’s veterans today with out of this world salutes and beautiful photos of the American flag back dropped by Earth from the stations orbital altitude of 250 miles (400 km) above the planet. See above and below. When they first set foot on the Moon, the Apollo 11 astronauts painted a picture of the landscape as a bone-dry desert. So astronomers were naturally surprised when in 2009, three probes showed that a lot of water is locked up in minerals in the soil. There has been some debate as to where the water came from, but now two researchers with the National Museum of Natural History in Paris, France, have determined that most of the water in the soil on the surface of the Moon was formed due to protons in the solar wind colliding with oxygen in lunar dust, rather than from comet or meteorite impacts. The first hints that there was water on the Moon came when India’s Chandrayaan-1 found hints of water across the lunar surface when it measured a dip in reflected sunlight at a wavelength absorbed only by water and hydroxyl, a molecule that contains one atom of hydrogen and one atom of oxygen. 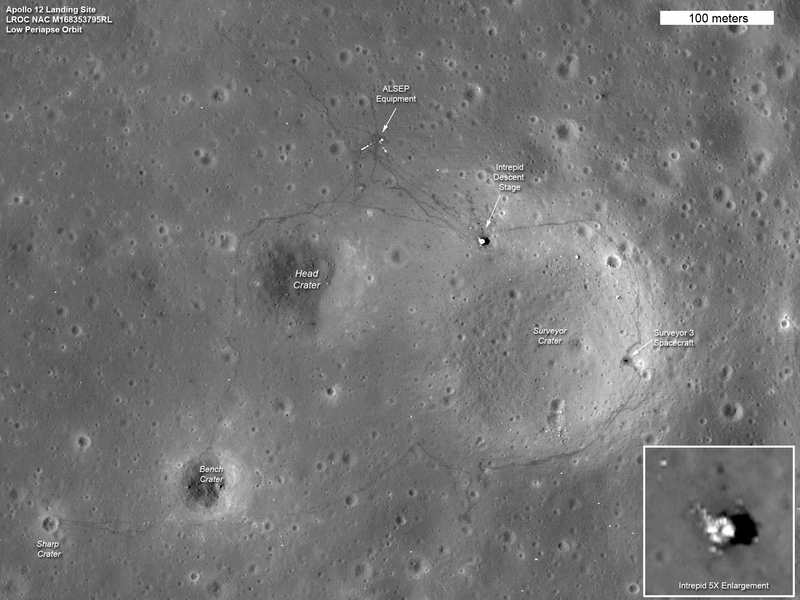 What Does The Apollo 11 Moon Landing Site Look Like Today? Forty-five years ago yesterday, the Sea of Tranquility saw a brief flurry of activity when Neil Armstrong and Buzz Aldrin dared to disturb the ancient lunar dust. Now the site has lain quiet, untouched, for almost half a century. Are any traces of the astronauts still visible? The answer is yes! Look at the picture above of the site taken in 2012, two years ago. Because erosion is a very gradual process on the moon — it generally takes millions of years for meteors and the sun’s activity to weather features away — the footprints of the Apollo 11 crew have a semi-immortality. That’s also true of the other five crews that made it to the moon’s surface. Editor’s note: We posted this yesterday only to find that the original video we used had been pulled. Now, we’ve reposted the article with a new and improved version of the video, thanks to Spacecraft Films. To the moon! The goal people most remember from the Apollo program was setting foot on the surface of our closest neighbor. To get there required a heck of a lot of firepower, bundled in the Saturn V rocket. The video above gives you the unique treat of watching each rocket launch at the same time. Apollos 4 and 6 were uncrewed test flights. Apollo 9 was an Earth-orbit flight to (principally) test the lunar module. Apollo 8 and 10 were both flights around the moon (with no lunar landing). Apollo 13 was originally scheduled to land on the moon but famously experienced a dangerous explosion that forced the astronauts to come back to Earth early — but safely. Apollos 11, 12, 14, 15, 16 and 17 safely made it to the moon’s surface and back. Skylab’s launch was also uncrewed; the Saturn V was used in this case to send a space station into Earth’s orbit that was used by three crews in the 1970s. And if this isn’t enough firepower for you, how about all 135 space shuttle launches at the same time? Read more about the Saturn V at NASA and the Smithsonian National Air and Space Museum. All Saturn V Launches At Once from Spacecraft Films on Vimeo. That video above is perhaps the ultimate off-roading adventure: taking a rover out for a spin on the moon. Look past the cool factor for a minute, though, and observe the dust falling down around that astronaut. The crew aboard Apollo 16 (as well as other Apollo missions) had a lot of problems with regolith. It got into everything. It was so abrasive that it wore away some equipment in days. It smelled funny and probably wasn’t all that good to breathe in, either. Many have said that when we return to the moon, dust must be dealt with for long-term survival. What the researchers did, in conjunction with ONERA (The French Center of Aerospace Research) was conduct simulations for two types of lunar regions — the terminator (the day/night boundary) and an area experiencing full sunlight. “Dust particles were introduced into the simulation over a period of time, when both the surface and the rover were in electrical equilibrium,” the Royal Astronomical Society stated. The bottom line? A lunar rover could accumulate a significant amount of dust on the moon, especially if it’s sitting at or near the terminator. This could be addressed by using dome-shaped rovers that would see the dust fall off, added lead author Farideh Honary, a physicist at the University of Lancaster, in a statement. The work was presented at the RAS National Astronomy Meeting today (July 3). A paper has been submitted to the Journal for Geophysical Research, so more details should be forthcoming if and when it is published. Astronaut pranks are, well, just a part of the job. Often they poke at a sore spot in the astronaut’s history, and Charles Duke found himself the subject of a particularly painful one in the 1970s. Duke was in the final moments of preparations before climbing into the Apollo 16 spacecraft, which was exploring the Moon in this week in 1972. It was a serious moment as Duke and his crew were about to rocket off to the moon. Then Duke got a surprise, courtesy of backup commander Fred Haise, as Duke recalled in an interview with NASA in 1999. We were up climbing into the command module on the launch pad, and [launch pad leader] Guenter Wendt and the team were up there. And so John gets in, and I’m the next in on the right side. And as I start to climb in, I reach in and I look over and taped to the back of my seat was a big thing, “Typhoid Mary suit—seat.” So, we had a … laugh over that. Yeah, Fred would never let me forget that. Typhoid Mary referred to Mary Mallon, a cook who was put under quarantine for the latter half of her life in the 1900s — against her stringent objections. She was accused of passing along typhoid to several families for which she did cooking, even though she didn’t show any symptoms herself. At the time, typhoid had no cure. Her curious story has been the subject of a PBS show and numerous books. The joke on Duke hearkened back to the ill-fated Apollo 13 two years before, when Duke’s son caught the German measles. Duke fell ill and unwittingly exposed several astronauts during his contagion period — including the upcoming Apollo 13 prime crew of Jim Lovell, Fred Haise and Ken Mattingly. Of the three crew members, Mattingly had not been exposed to the German measles. This led to Mattingly being yanked from the mission days before launch. Adding to the drama, Apollo 13 suffered an explosion in space that crippled the spacecraft and, without the extraordinary efforts of the astronauts and Mission Control, could have killed the crew. Anyway, Apollo 13 came back safely, and in 1972 lessons had been learned from the mission. Haise, to his credit, wasn’t afraid to poke a little fun at the early havoc Duke’s illness wreaked on his crew. What are your favorite astronaut pranks? This panorama has now been put into a “Zoomify” making it fully interactive and lots of fun to explore. Grab your 3-D glasses, and you can find a rock and zoom in, follow the astronauts’ footprints and see one of the astronauts tinkering with the Lunar Rover. Click here and enjoy! Beltramini’s initial plan was to create just a few 3-D anaglyghs, but once he got started, he just kept going. But of course, the Apollo 16 images taken by astronauts John Young and Charlie Duke as they walked, bounded and drove the lunar rover on the Moon’s surface were not originally taken with the intent to be made into 3-D view, making Beltramini’s job fairly difficult. But over time he figured out how to make it work, “thanks to the phenomenon of rotation around a nodal point during the panning of the Apollo missions is possible, if there is plenty of overlap of the images, create a 3D 360 degree panorama,” he told Universe Today. Apollo 16 was the fourth mission to land on the moon and launched on July 26, 1971, and the astronauts returned to Earth on August 7. Find out more about Apollo 16 here. 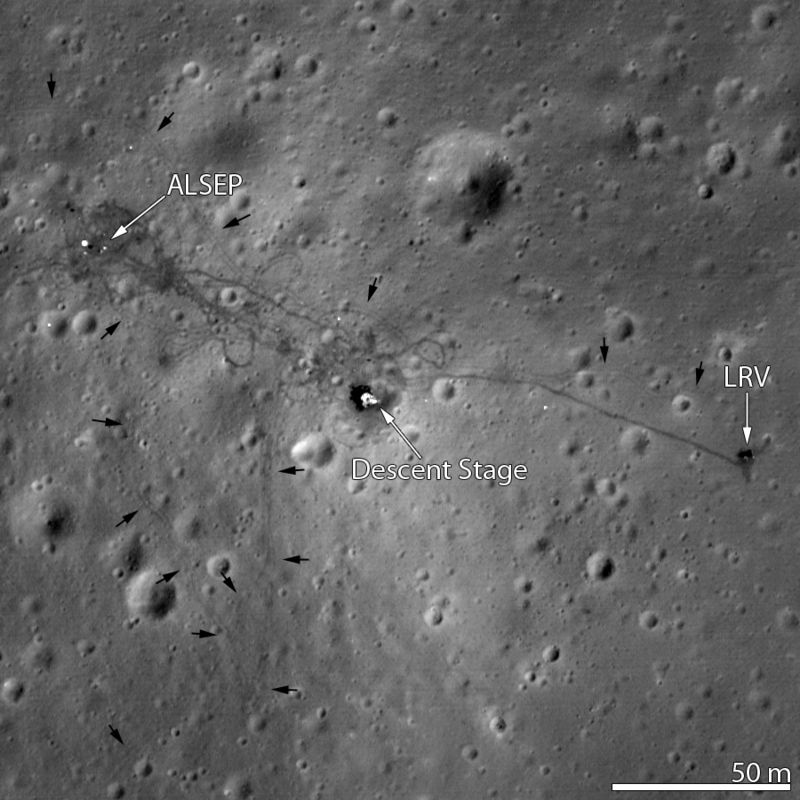 NASA’s Lunar Reconnaissance Orbiter (LRO) made a low pass over the Apollo 16 site last fall, capturing images of the leftovers from John Young and Charlie Duke’s 1972 exploration of the Descartes Highlands. The video above takes us on a tour of the Apollo 16 site from lunar orbit, and includes audio from the original communications and some very nice comparative photos and video clips showing the same features from ground level. The goal of Apollo 16 was to explore for the first time a lunar highlands location, and collect samples of what were initially thought to be volcanic rocks. The rocks were believed to be of a different material than what was collected during previous missions. As it turned out, the rocks collected by Duke and Young weren’t volcanic in origin at all; they ended up being breccias — cemented-together chunks ejected from ancient cratering events hundreds of miles away. Apollo 16 also set up various experiment packages to study lunar geology, magnetism and the solar wind. 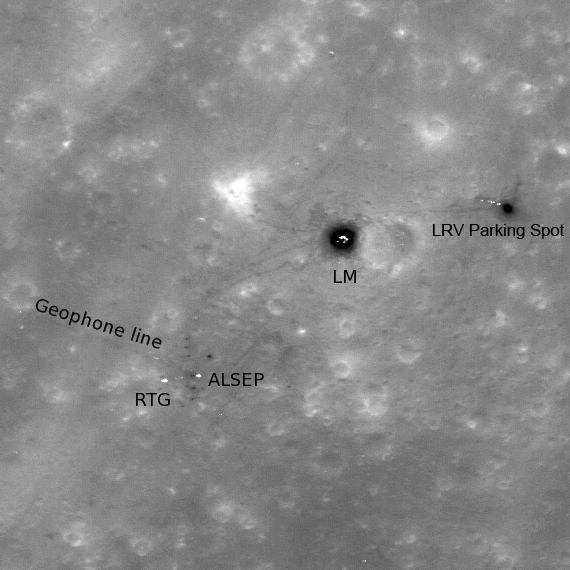 The Lunar Roving Vehicle (LRV) allowed Young and Duke to travel across a much wider area than they would have otherwise been able to on foot. 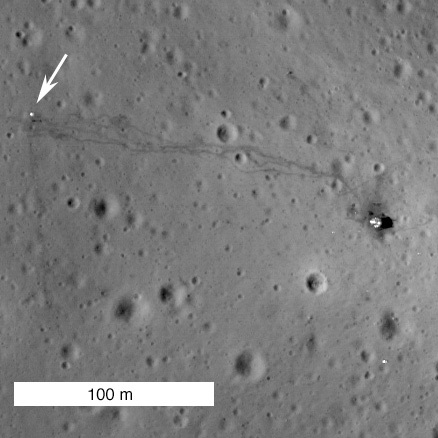 It was the second mission to use an LRV, and the rover — as well as its tracks — are still there today, looking exactly as they did when they were left 40 years ago. The Apollo 16 ascent stage lifted off from the lunar surface on the evening of April 23, 1972 and docked with the Command Module containing Ken Mattingly. The following day the astronauts began their trip back to Earth, completing the 250,000-mile traverse three days later on April 27. The Moon would be visited again in December of that same year during Apollo 17, the last mission of the program and the last time that humans would walk on the surface of another world. 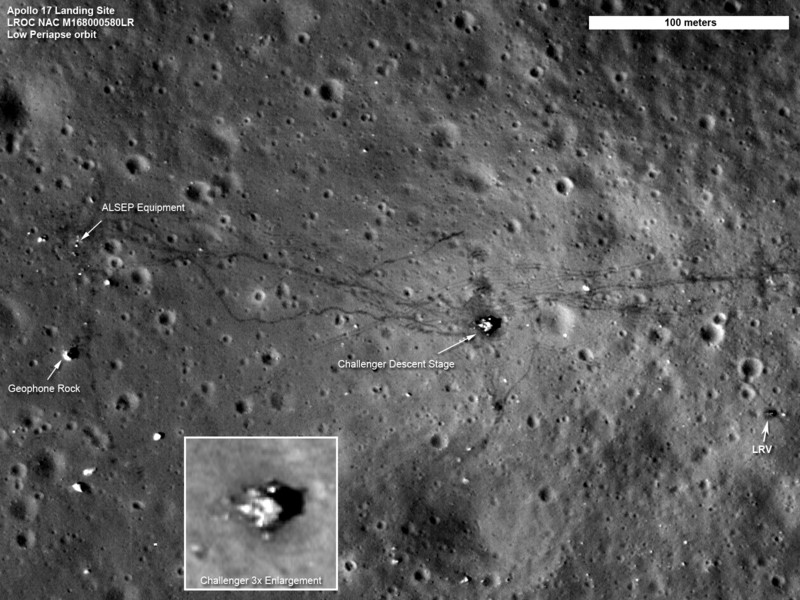 Now, 40 years later, satellites orbiting the Moon take pictures of what was left behind by these historic events. Perhaps someday soon the sites will be visited from ground level… maybe even by a new generation of astronauts. Read more about this on Arizona State University’s LROC site, and explore the full-frame Narrow-Angle Camera image from the LROC here. Well, the family photo, anyway. On April 23, 1972, Apollo 16 astronauts Charlie Duke and John Young embarked on the third and final EVA of the mission, exploring the Descartes Highlands via Lunar Roving Vehicle. During the EVA, before setting up a Solar Wind Collector, Duke placed a small family photo he had brought along onto the lunar surface and snapped a few photos of it with his Hasselblad film camera. This is one of the photos. The portrait shows Charlie, his wife Dorothy, and their two sons Charles and Thomas. It looks like they are sitting on a bench in the summertime. The family photo, gingerly wrapped in clear plastic and slightly crumpled from being stashed in the pocket of a space suit, was left on the Moon. It presumably still sits there today, just inches away from Charlie’s boot print — which, presumably, is also there. At the time of this writing it’s been exactly 40 years to the day that this photo was taken. I came across this image while looking through the Project Apollo Image Archive for some relevant images from the Apollo 16 mission. Amid scans of Hasselblad photos showing lunar samples, experiments and scenes from LRV jaunts, which are all fascinating in their own right, I came across this poignant image and couldn’t resist sharing it. To know that a family photo is resting upon the surface of another world is nothing short of amazing… while the missions to the Moon were a testament to human endeavor, it’s small things like this that remind us of the people that made it all possible.